Beef, teriyaki sauce, sugar, water, pineapple juice, honey, chipotle chile, garlic powder, black pepper, liquid smoke, sodium nitrite. The first thing I taste from this jerky is a sweetness with touches of pineapple. There's a faint bit of spice and a light salt. The chewing brings on some of the liquid smoke, along with a noticeable chile pepper flavor, and touches of chipotle. I also pick up a subtle honey. For being marketed as "Honey Chipotle" it seems to hold up fine. The chipotle flavor is perhaps more noticeable than the honey, having a light smokiness, yet an unmistakable chile pepper flavor. The honey is less noticeable, but more represented as a sweetness than the actual honey flavor. 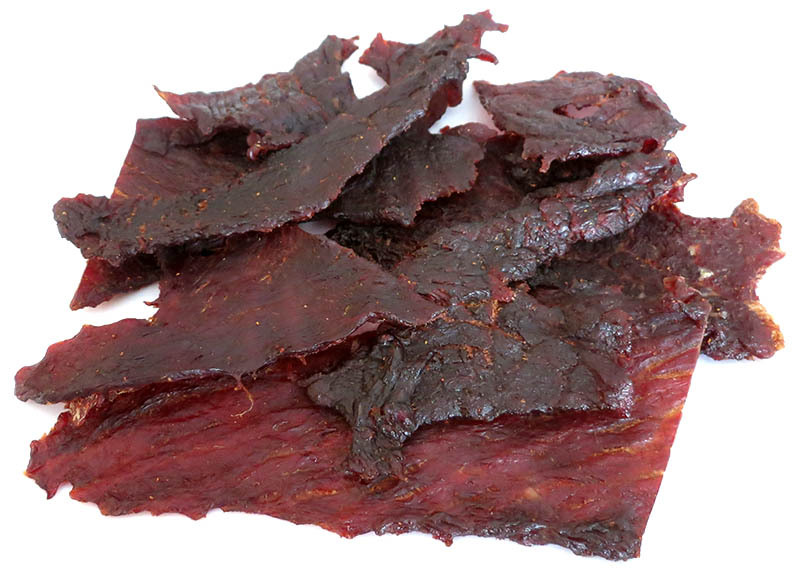 Otherwise, the primary taste profile of this jerky is sweet, with a light smokiness, and a noticeable chile pepper. The level of heat in this seems light to moderate, not really as hot as the company claims. If you're not used to spicy food, certainly you could find this as hot. But as a spicy food lover, I'd rate it on my personal heat scale as "mild medium" (level 2 out of 5). The chewing texture is chewy. It can take some chewing effort to get through one of the larger pieces, but not too bad if you take your time with it. The heavier sweetness tends to make this feel somewhat gummy at first. Otherwise, these pieces appear to be all meat, with no noticeable fat, and no noticeable stringiness. 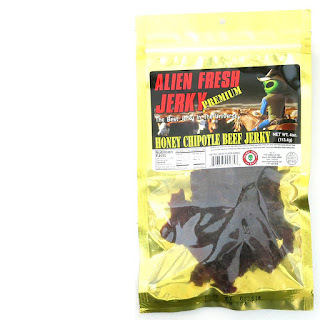 This Honey Chipotle beef jerky from Alien Fresh Jerky offers up a light to moderate spiciness with a noticeable smoky, chile pepper flavor, along with a strong sweetness. Those of you who love the sweet & spicy combination in beef jerky will certainly enjoy this newer offering from Alien Fresh. If you're already a spicy food lover, you won't find this to be that hot at all, yet just hot enough. If you're not, you'll actually get enough heat to feel the endorphin rush without having to put out the fire. Despite the chewiness, I found the pieces to be all meat, with no fat, and no stringiness, which appeals to the manly meat lover in me. 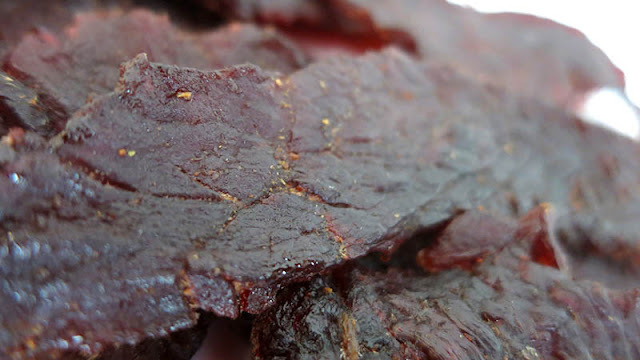 Overall, it's a jerky that holds true to the classic, chewy slab tradition, delivers its promise of smoky, chipotle flavor, but at a spiciness that should satisfy both ends of the heat spectrum.